Keeping my paws on the nuts of the world! Dogs are loyal and great companions to so many people. They give us unquestionable love and are always there to cheer you up. They offer free kisses (like Houdini here at the Hotel Thompson). Humans and other anipals count on them in so many different ways. There are dogs that are pets. There are dogs that are working dogs – like those that help lead the blind and help in search and rescue. Regardless of what type of dog you are, most humans count you as family. Today, August 16th, is National Tell a Joke Day. YAY! Today should be filled with chuckles and laughs all around. Participate in this laughable day and tell some jokes. Do it in person, pass it along in a few emails or blog about it. The more jokes you tell today, the more fun today will be. Start the laughter and keep it flowing. In honor of this day, Bacon has decided to tell a few jokes that he has heard. Get ready to laugh friends. Why are sharks mostly salt water creatures? – Because pepper would make them sneeze. – Because if they flew over the bay they’d be bagels. What do you get when you cross a flower and a dog? Hello dear friends. Today is the official Book Lovers Day. Don’t you just love a great book. Something that takes you away from the every day ordinary life that you have. Something romantic – something exciting – something spy or a great mystery. Anything that you can read to put you in another life or another space in time. Reading can be for fun, educational, relaxing or research. Reading can make us laugh, smile or even cry. Today, I encourage you to find that interesting book – of any topic that intrigues you. Open the book and start your journey anywhere – in the house, on your bed, in the grass, on a hammock. Go away, even for a couple of hours, to a place that you don’t need a passport to travel. 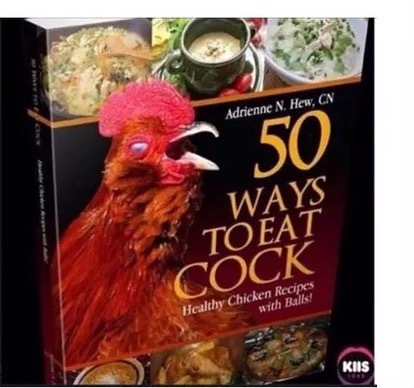 I myself will be researching some recipes. There are a couple of chickens and roosters that don’t know what time it is in our hood. I’m researching ways to help them – even chitter chatter. No really, just researching some interesting recipes. Now my friends, go find your book! Now friends – this is a holiday that we can ALL be involved in and celebrate. Today is Wiggle Your Toes Day. But let us not forget the ones that have paws or hooves. So we shall change it just a bit to include ALL. For humans, they cramp their toes into sneakers or Lord forbid heels all day. Can you imagine that my fellow anipals? Thankfully, us anipals are smarter than the average human. We let our paws and hooves be free to wiggle everywhere all day long. In the grass, in the water, in the sand – it doesn’t matter where. And did you know that all toes are different in come in different sizes and shapes. Some humans have less toes and some have more. Some of us anipals even have webbed paws or toes. All of us different. But one thing is sure – We are *all* unique. Who could ask for a better day? The first Sunday of August is always Friendship Day. Isn’t that a wonderful day to celebrate? What is better than friends – whether they come in the human form or the animal form. Friends are always there with us in good times and in bad times, to share special moments in our lives. Sometimes all it takes is just a smile, holding a hand, a hug or just an ear or shoulder to cry on. Friendship Day should be celebrated by phone, in person or by reaching out in an email or blog. You don’t have to live next door to show someone how much you care. Express your friendship in some way today and show the ones that you love what they mean to you. August 3rd is a grand and awesome day for that little pig called Bacon. It is National Watermelon Day. Heck yeah this big ole fruit deserves an entire day all to itself. Watermelon is 90% water but 100% goodness. 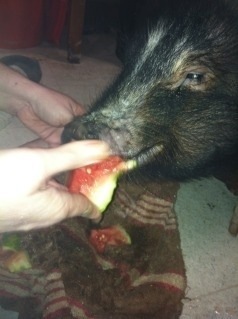 Do you know that little oinker here loves his watermelon – rind, juice and ALL! 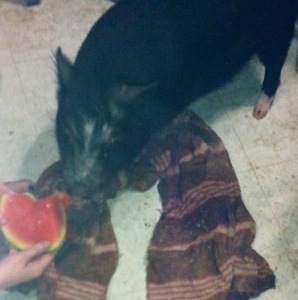 I’m attaching some pictures for your amusement of a watermelon bash he had not too long ago where watermelon went flying everywhere! 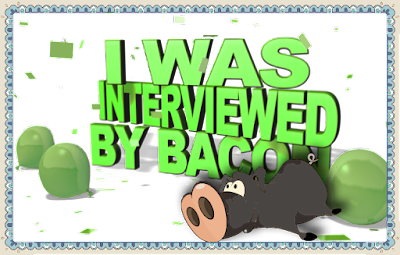 I think it took Bacon’s mom several hours to clean up the mess but she said it was well worth it to make some memories and have fun with the Bacon. Way to go mom! Go out today and enjoy you some watermelon! Make some memories and have a blast. Journalist Rocky the Squirrel here – Keeping my paws on the nuts of the world! This is just not a backyard problem or a school playground problem. This is a worldwide problem. A problem that needs to come to an end. Everyone has differences – we wouldn’t be individuals if we didn’t. But when you look down to it, we all want to be happy and what better way than to get along. Today let’s make friends with different people, different cultures and different countries. Extend your hand – or an olive branch – and say hello friend. Say hello to your neighbor, to the stranger at the market and say hello to a person that you see everyday but you don’t even know their name. Today is the day to make a friend near and far. To all of our friends, we at the Hotel Thompson would like to say thank you for being our friend – happy friendship day. And to those that don’t know us yet, Happy Friendship Day. May we get to know you better today and in the future! Who will YOU say hello friend to today?